The Angriest: Star Trek: The Next Generation: "Lonely Among Us"
The Enterprise is en route to the planet of Parliament, where two rival species - the Anticans and the Selay - will apply for membership to the United Federation of Planets. When the ship passes by a strange cloud of gas in deep space, an electrically charged entity invades the ship and begins to take over members of the crew. "Lonely Among Us" is a strange, messy episode, but for all its scrappy, shaky quirks I couldn't help but enjoy it. It is far from perfect, but after so many irredeemably bad episodes this season I'll take what I can get. In particular the predatory antics of the Anticans and the Selay - sneaking around corrdiors, laying traps, murdering and eating rival delegates - is an entertaining diversion. The main plot, in which an alien entity jumps from officer to officer in an attempt to turn the Enterprise back to the cloud from which the alien came, is less successful. I remember when I first saw this episode, all the way back in 1988, that the Anticans and the Selay seemed particularly cool. They're only really the second and third proper aliens we've seen in The Next Generation, after the Ferengi, and when you're a 12 year-old kid aliens in silly rubber suits is part of what makes science fiction TV great. Star Trek generally veers towards the "bumpy head" style of aliens, where they're essentially humans with a few cosmetic differences. 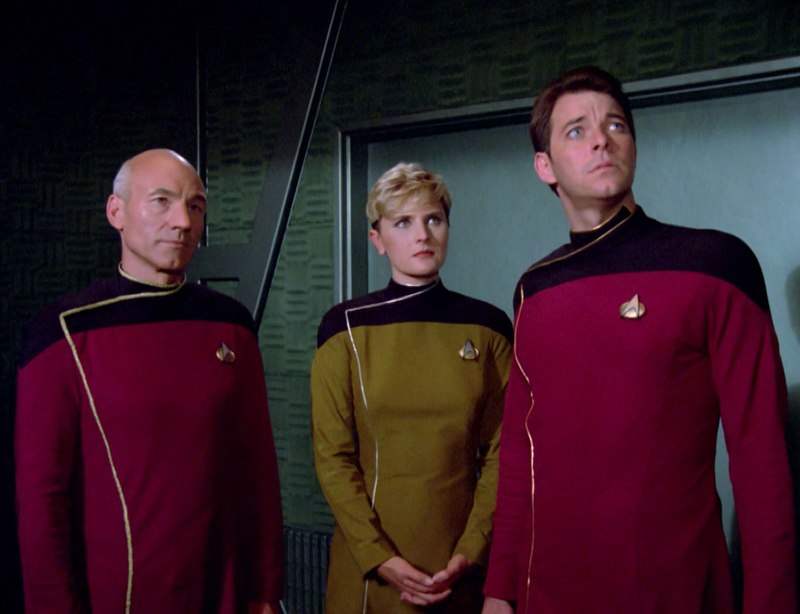 It's refreshing to see wolf people and snake people in the Enterprise, even if their costumes are pretty unconvincing. The idea of an incorporeal alien jumping from officer to officer is a pretty decent one, and is handled remarkably well - until the climax, that is, at which point it all gets rather silly. The Enterprise's successful rescue of Captain Picard from a cloud of space dust is one of the more unbelievable things the series has done, and dampens an otherwise successful storyline. There are a lot of 'firsts' in this episode. The Selay leader is played by Marc Alaimo, making the first of several guest appearances in the series. He subsequently plays recurring antagonist Gul Dukat on Star Trek: Deep Space Nine. Chief O'Brien (Colm Meaney) makes his first appearance since "Encounter at Farpoint", and now wears his more familiar gold uniform. Data is introduced to Sherlock Holmes, a fascination that continues throughout the series. Lt Singh (Kavi Raz) has the unfortunate honour of being the first Enterprise crewman to die. He's the ship's assistant chief engineer - we don't get to see a chief engineer this episode, but clearly there's a lot of churn going on in that particular department. So: messy but amiable. I'm giving this episode the thumb's up. That leaves the series with two good episodes out of six, or 33%. It's your commitment to going back and reevaluating undervalued and obscure genre properties that impresses me the most. At last, Star trek is getting the critical recognition it deserves.